The Census Campaign received a generous amount of attention yesterday in the Comment is Free section of the Guardian, courtesy of an article written by Deborah Orr. Unfortunately, the commentary was not entirely complimentary with respect to the campaign and humanism more generally. You can read the article here on the Guardian website. In response, we would like to draw attention to a comment written by one of our trustees, David Pollock: we couldn’t have said it better ourselves! Deborah Orr should find out a bit more about humanism and humanists before she next writes about us. She might find that she has a lot more in common with us than she imagines – but sadly articles like hers perpetuate the myth that the British Humanist Association is a bastion of “combative and dogmatic atheism” combined in some odd emulsion with “irreligious mumbo-jumbo” – accusations that are so far off beam as to be ludicrous. We are committed to human rights and to the freedom of those with “beliefs we can’t share” to pursue them and – yes – to evangelise about them. As long as multiculturalism does not mean separation and political bribes, we are multiculturalists – certainly in Deborah’s “wet” sense. So we too “don’t want to stand against ‘believers'” – except that (a) in explaining Humanism we will say why we disagree with religious belief, and (b) we will certainly stand against privileges for religion such as have been showered on so-called ‘faith communities’ for the last decade (partly excused by reference to the 2001 Census), and that not just because of the unfairness of the policy but (mainly) because in our view it is bad for society and the non-religous majority of people. Deborah attributes to us “the idea that humans are essentially good and wise”. Wrong again. In our view humans have the capacity to be good and wise – but also to be the opposite, and it is our responsibility to foster the one capacity and tame the other. Deborah says that “humanism sounds like religion without God”. Wrong again. Humanism is certainly a lifestance, a worldview – if you like, a way of making sense of life. But religions are a particular sort of lifestance, characterised typically by beliefs in the transcendental, by sacred books, by required rituals, by mystery and unquestionable truths and by moral injunctions that sometimes have little to do with human consequences. Non-religious lifestances such as Humanism share none of these characteristics. So, sorry, no: it’s not “dogma – really”. Humanism is – really – not an “-ism”: it has no source book of unquestionable rules or doctrine. You don’t ‘convert’ to Humanism and then have to take the rough with the smooth. Instead, most people become humanists without contact with any humanist organisation or even necessarily knowing of the word. Rather, Humanism rather is a label for a range of beliefs and attitudes. To the extent that your beliefs and attitudes coincide with that range, then the label humanist is more or less appropriate for you. Deborah concludes that “The tide of history is running against the religious”. For the moment, in some parts of the world, this may be true. But this has not just happened: it is the result in part at least of demonstrating that living without religion is not a matter of casting adrift from all meaning and morality. Humanism in all its many variants is not only a possible but a rewarding way of life that offers value to both the individual and society. Now, Deborah – how about another article based on the facts? what account the Office for National Statistics took of the proportion of the population who do not follow a religion in preparing the forms for the (a) 2001 and (b) 2011 Census. A question on religion was included in the Census in England and Wales for the first time in 2001 following the Census (Amendment) Act 2000. Responses to the question helped provide information which supplemented the output from the ethnicity question by identifying ethnic minority sub-groups, particularly those originating from the Indian sub-continent, in terms of their religion. The wording and design of the question and response categories were determined after extensive consultation with users and other key stakeholders and a programme of question testing. Information from the religion question is used to supplement ethnicity data to gain a general understanding of society; to inform service provision and resource allocations; and for fulfilling legal obligations to monitor inequalities. ONS recognised that no single religion question could meet all user needs and after a programme of research and testing, ONS decided that religious affiliation – the number of people who identify with a religion irrespective of the extent of their religious belief or practice-was again the most appropriate concept to measure. Affiliation is a socially significant indicator in its own right that relates to a person’s cultural background and values. This response is important because it lays out the important uses that census data is put to, and makes clear that the religion question does not measure religious belief or practice, but only cultural affiliation. Yet, data from the last census has been repeatedly used as if it does measure religious belief or practice. If the policy-makers are going to continue misusing the data in the same was as they have over the last decade, it is vital that we ensure that all those who are not religious tick ‘No Religion’ on the forthcoming census, irrespective of any cultural affiliation they have. 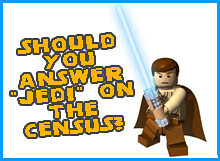 In the last census, over 390 000 people claimed they belong to the Jedi religion: about 13 000 more than those who self-identified as Jewish. Rock out and identify yourself as belonging to the 'Heavy Metal' religion? As the 2011 census arrives on our doorsteps, many different ‘religions’ are vying for the attention of the sceptical: a brief scroll through Facebook groups reveals 35 000 fans of ‘Heavy Metal’ as the religion of choice; however you might feel more at home with ‘Dumbledore’s Army’ (514 fans) or ‘Pokemon Master’ (444 fans) as your religion. We strongly urge all those who are not religious to resist the temptation of giving a jovial response, and to tick ‘No Religion’ on the census. It is true that some ‘religions’ which are obviously tongue-in-cheek are filed under ‘No Religion’ by the Office of National Statistics – but that is not guaranteed. Even more important, there are further bodies who use the census data, and who have a great deal to gain by distorting the nature of the data. Unless we present a united front under ‘No religion’, it will always be possible for religious organizations to disaggregate the data to their advantage. According to the last census, for every one atheist/humanist in England and Wales there were 2,037 people who identified themselves as Christian. The number of atheists and humanists in the 2001 Census in England and Wales was only 18,654, while those who said they were Christian in England and Wales numbered 38 million – 71 per cent of the population. While this is factually correct, it fails to account for the other 8,577,834 who self-identified as not having a religion. The data, when presented truthfully, show the non-religious to be the second biggest group of respondents after Christians: rather than 1:2,037 (as quoted above), the ratio of non-religious to Christians measured in the last census is 1:4.8. Of course, for this year’s census, we expect that ratio to be more like 1:1! We want to make sure that this sort of cherry picking of census data is much harder to do. If all those who are not religious tick ‘No Religion’, we will send out a clear, unified message to policy makers that cannot be misconstrued or distorted. And this really does matter – remember that over the last decade, the census data statistics on religion have been used to justify an increase in the number of state maintained faith schools, to keep the unelected Bishops in the House of Lords, and to justify pouring state funds into religious organisations. As faith plays an ever increasing role in public services and government, it is vital that the non-religious stand up together to be counted in this month’s census. After being rejected by advertising space owners on the railway network, Census Campaign posters are back with a vengeance. Our original slogan, ‘If you’re not religious for God’s sake say so’ is now appearing in animated form on digital panels, bringing the campaign off the streets and into shopping centres for the first time. The campaign was prevented from booking posters at railway stations following advice given to our media agency by the Committee of Advertising Practice (CAP) that the slogan ‘If you’re not religious for God’s sake say so’ may cause ‘widespread’ and ‘serious’ offence. As a consequence the BHA’s media agency said that even a modified version of the slogan, omitting ‘for God’s sake’, was not acceptable to their franchise partners on the railways. Chief Executive of the BHA Andrew Copson said, ‘It is clearly not the case that any and all humorous references to religion are “offensive” and there is nothing shocking or mean-spirited about employing a common phrase which happens to reference the subject matter. Sensible advertisers know this. Window stickers for one and all! As a big thank-you to our wonderful supporters, we have decided to extend the offer and send out Census Campaign window stickers to anyone who wants one. These will look like the graphic above, and can be put up on car windows, office windows, home windows and more! Thanks again to the generous donor who made this possible. Posted in Uncategorized	| Comments Off on Window stickers for one and all! We have reached our £15,000 target! We’ll also send out a bumper sticker or two to every new donation given over the next week (while stocks last). Please make sure you include your address on the JustGiving site, tell us why you are ticking ‘No Religion’ in the comment box, and you will receive a ‘thankyou’ bumper sticker in the post shortly after. We have upped our target to £20,000. We have new advertising opportunities and all money raised will go towards advertising for the campaign. We don’t have long to go now, so please give generously and we will spread the word!